Another round of snow could be coming to the D.C. region next week, so road crews are busy patching potholes before they grow. Here's how to watch out for them, and how you can report problems. LARGO, Md. — Another round of snow could be coming to the D.C. region next week, and wet freezing temperatures spawn potholes, so road crews are busy patching problems before they grow. 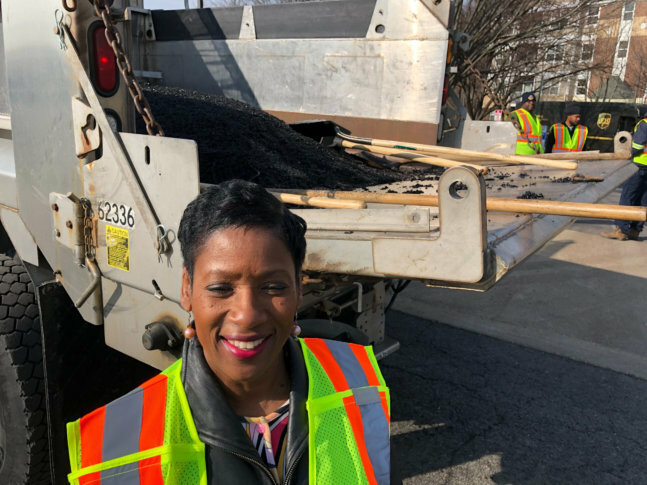 “We actually have been filling (potholes) throughout the season, but now we’re doing what we call our ‘blitz,’ because the weather is cooperating and this is a wonderful opportunity for us to be out here,” said Paulette Jones, of the Prince George’s County Department of Public Works and Transportation. The county fills 16,000 potholes a year on average, Jones said. Patching pavement a shovel at a time can be a dangerous situation for a road crew if speeding drivers aren’t paying attention. “We have our crew out here and we have signs saying ‘Slow,’ and even with that, motorists are still driving extremely fast,” Jones said to WTOP. On a recent afternoon, cars indeed sped by. “We’re out there trying to ensure the safety of the roadways by filling the potholes, but we need to assure the safety of the crews as well,” she added. Slowing down for work zones is a universal message. Jurisdictions regionwide also want you to report potholes, and WTOP has compiled a list of contacts to do so in your area.